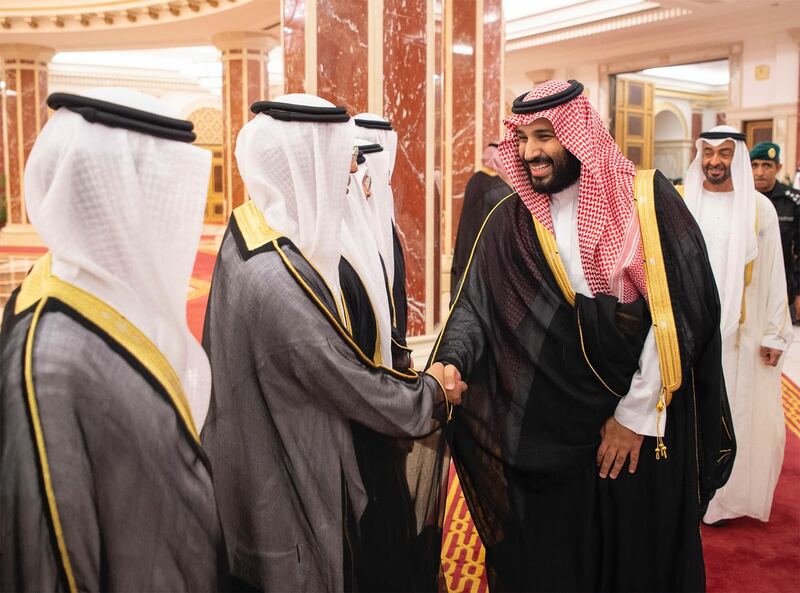 Jeddah: The UAE and Saudi Arabia announced on Tuesday a joint vision for economic, developmental and military integration through 44 joint strategic projects. A total of 350 government officials from different fields prepared “The Strategy of Resolve” within 12 months. The strategy outlines three main axes: the economic axis, the human and knowledge axis, and the political, security and military axis. The announcement of the strategy came during the first meeting of the Saudi-Emirati Coordination Council, chaired by His Highness Shaikh Mohammad Bin Zayed Al Nahyan, Crown Prince of Abu Dhabi and Deputy Supreme Commander of the UAE Armed Forces, and His Highness Prince Mohammad Bin Salman Al Saud, Crown Prince, Deputy Prime Minister and Minister of Defence, Chairman of the Council for Economic Affairs and Development. The leaders of the two countries have set a timeframe of 60 months to implement the strategic projects aimed at building an exceptional model between UAE and Saudi Arabia which supports the works of the Gulf Cooperation Council. The strategy also protects the interests of both countries and creates new opportunities for them both. During the meeting, a number of joint projects were announced, including a unified strategy for food security, a unified plan for medical stocks, a common supply security system and joint investment in oil, gas and petrochemicals. The Strategy of Resolve also includes a plan to establish an agricultural investment company with a capital of Dh5 billion, a joint venture fund for renewable energy and a third investment fund for small and medium enterprises. The strategy will also facilitate the flow of traffic in ports, build a unified industrial database, empower the banking sector in both countries, harmonize economic procedures and legislations and create a joint council to coordinate foreign investments. The areas of cooperation identified by the Strategy of Resolve also include security and military cooperation and integration, coordination of foreign military assistance and standardisation in the military industry sector. The two sides will work during the coming period on activating the joint manufacturing industries, implementing the electric linkage project, launching joint housing and financing services and solutions, establishing a joint centre for the development of desalination technologies, cooperation in the management of infrastructure projects, and cooperate in the development of modern financial technology techniques. The first meeting of the Joint Coordination Council witnessed the signing of 20 memorandums of understanding to enhance the Saudi-UAE cooperation in various fields. A number of strategic projects were launched, and the structure of the Council was announced. The Council will follow up the implementation of projects within the set timeframe. Attending the meeting were Shaikh Tahnoun Bin Zayed Al Nahyan, National Security Adviser, Shaikh Mansour Bin Zayed Al Nahyan, Deputy Prime Minister and Minister of Presidential Affairs, Shaikh Abdullah Bin Zayed Al Nahyan, Minister of Foreign Affairs and International Cooperation, Shaikh Zayed Bin Hamdan Bin Zayed Al Nahyan, Shaikh Shakhbout Bin Nahyan Al Nahyan, UAE Ambassador to Saudi Arabia and a number of ministers. Shaikh Mohammed Bin Zayed Al Nahyan said: “The UAE and Saudi Arabia have strategic relations based on solid foundations of unity, joint vision, objectives and cooperation under the blessings of His Highness Shaikh Khalifa Bin Zayed Al Nahyan, and the Custodian of the Two Holy Mosques His Royal Highness King Salman Bin Abdul Aziz Al Saud, King of Saudi Arabia. Shaikh Mohammad Bin Zayed also added that Saudi-Emirati Coordination Council supports the objectives of the GCC under the leadership of Saudi Arabia. “We have a historic opportunity to create an exceptional Arab model of cooperation. Our solidarity and unity protect our interest, strengthen our economies and build a better future for our peoples,” Shaikh Mohammad Bin Zayed said. The first meeting of the Saudi-Emirati Coordination Council comes within the framework of cooperation between Saudi Arabia and the UAE to consolidate brotherly relations and their desire to intensify bilateral cooperation and integration through continuous consultation and coordination in various fields. Based on the directives of President His Highness Shaikh Khalifa Bin Zayed Al Nahyan, and Custodian of the Two Holy Mosques King Salman Bin Abdul Aziz Al Saud, the Saudi-Emirati Coordination Council was established in May 2016 to achieve the common objectives of both countries and enhance the work of the GCC. The Strategy of Resolve was adopted during the meeting of the Saudi-Emirati Coordination Council as one of the main outputs of the council. The council set a timeframe of five years to implement the projects outlined in the strategy. The strategy aims to create an exceptional model of integration and cooperation between the two countries through the implementation of joint strategic projects for the happiness and prosperity of the people of the two countries. The strategy comprises three main axes: economic, human and knowledge, political, security and military, as well as 44 joint projects out of 175 total initiatives. On the sidelines of the first meeting of the Saudi-Emirati Coordination Council, the UAE signed 20 memorandums of understanding with Saudi Arabia to tackle areas of priorities and kick-start the implementation phase. The projects represent a new phase in cooperation between the UAE and Saudi Arabia. The Strategy of Resolve includes strategic projects for each of the three main axes. The economic axis aims at strengthening the integrated economic system between the two countries and finding innovative solutions for optimal utilization of existing resources. The economic axis focuses on the following areas: financial services and markets, logistics and infrastructure, production and industry, supply’s security, customs union and common market, environment, agriculture and water, renewable energy, tourism and national heritage, business leadership, foreign partnerships, government development and government services, housing, youth, sports, oil, gas and petrochemicals. - Launching the policy of empowering the banking sector to enable branches of banks in the two countries to enhance their business and benefit from the available growth opportunities, and facilitate the work procedures in both countries. - Exchange of experiences in the field of modern financial technology to identify opportunities and challenges. - Sharing experiences in the insurance sector to improve and support insurance markets in terms of products, pricing and regulatory mechanism. - Sharing experiences in infrastructure management. - Sharing experiences in the field of safety and road maintenance. - Establishment of a joint investment fund to invest in small and medium-sized enterprises of the emerging industrial sectors in partnership with the private sector. - Activate value-added manufacturing industries in combination with existing industries to support manufacturing industries and implement them through small and medium enterprises in the fields of iron, aluminium and petrochemicals. - Building a precise and standardized industrial database as well as standardization of coding systems for industrial goods and services. - Conduct a joint exercise between the two parties to test the supply security system in key sectors. - Develop a strategic medical stock plan, establish a joint plant for the manufacture of sensitive medical drugs, and establish a joint reference laboratory to achieve safety standards in this field and exchange experiences, cadres and medical staff in the field of emergency and crisis. - Joint cooperation in the field of taxation. - Facilitate the exercise of economic activities and exchange of investment opportunities through the establishment of a dedicated office to facilitate the economic activities, and the establishment of a unified electronic portal linking the two countries to follow-up on complaints and suggestions concerning the common customs and markets. - Facilitate the flow of traffic in the ports by addressing the obstacles facing the flow of traffic and trade across borders and propose necessary solutions. - Establishing a joint venture company for agricultural investment, with a capital of 5 billion dirhams, to contribute to the provision of imported commodities to both countries and achieve sustainable food security. - Adopting a unified strategy for food security in both countries to harness productive resources (agriculture, livestock and fisheries) and work on joint strategic projects to enhance future food security of the two countries. - Establishment of a research centre to develop and localize desalination technologies to study the application of desalination techniques and the conversion of moisture into water using renewable energy and to consider the utilization of thermal energy for evaporation and desalination processes. - Establishment of a Council for Environmental Excellence to protect the environment and wildlife between the two countries, for the purpose of unifying environmental efforts and international positions and standardizing the linking and monitoring processes in various environmental fields. - Establishment of the Saudi-Emirati Investment Fund for Renewable Energy to attract large and start-up companies and support them in funding research and development projects. - Implementation of the Gulf electrical interconnection system, in order to benefit from the productive capacity of energy to both countries. - Exchange of experiences in the nuclear energy sector. - The launch of a common vision and identity of tourism and national heritage of the two countries, in order to attract more tourists to the region and to develop programs to optimize the potential of tourism and heritage of both countries. - Harmonisation of regulations, procedures and legislation between the two countries on entrepreneurship and small and medium enterprises. - The establishment of an investment advisory board, with the aim of cooperation and transfer of knowledge in the field of foreign investments and coordination, and the development and expansion of relations and networks in the investment community, in addition to strengthening cooperation between the Saudi investment companies and strategic companies. - Cooperation in creating investment opportunities in Saudi Arabia and the UAE. - Develop government services and transfer experiences between the two countries, and identify development opportunities for laws and procedures. - Develop the security of government services, through the formation of a joint team to respond, build capacity, and deal with the electronic security of government services. - Developing knowledge exchange platforms for educational and training services. - Launching the innovative housing solutions program to reduce / eliminate restrictions (legislative, financing and procedural) that slow down the development of housing services and reduce the challenges facing the sector. - Launching the residential welfare program for the citizens of the two countries, with the aim of stimulating and motivating the financing agencies to provide integrated housing products to citizens, attracting modern construction techniques and encouraging local manufacturing, as well as developing the necessary legislations and guarantees to stimulate the residential sector. - International joint investment in the oil, gas and petrochemical sector. - Cooperate in applications to convert carbon dioxide into petroleum products. - Cooperation in the research and development of various applications related to the oil, gas and petrochemical sector. The human and knowledge axis aims to create and effective and integrated educational system for both countries to prepare highly qualified generations of citizens. It focuses on the following fields: higher education, research cooperation, public education and technical education. - Cooperation between institutions of higher education through the development of a joint plan to promote common programs between the Saudi Arabia and the UAE universities to enable students to benefit from educational institutions in both countries. - Developing early childhood policy, with the aim of building common early childhood standards that are consistent with international standards. - Launching the digital education system, which includes a complete digital file for each learner (academic, health, etc.) that enables him/her to explore the future of each career sector and set expectations for learner’s academic and professional path based on artificial intelligence systems. - Establishing the Saudi-Emirati Committee for Technical Education Policy, which is responsible for the harmonization of strategies, standards and professional qualifications between the two countries. The policy will also provide databases for future training needs and sharing experiences in public and private sector partnerships. - Establishing a virtual college to provide appropriate technical disciplines, aiming to create a global Arab smart platform that includes training programs and materials (project management, industrial safety and inspection training), virtual exercises (such as special exercises for people with special needs), and technical and vocational qualifications required by the labour market in both countries. - Promote innovation in technical education by creating a common platform that includes innovations and creations. The political, security and military axis aims at enhancing cooperation and integration between the two countries in the political, security and military fields, thus maintaining the sovereignty of both nations regionally and globally. It focuses on the cooperation and integration in following areas: military, political, and security. This axis includes a number of initiatives such as the joint manufacturing of ammunition, light weapons, vehicles, and electronic shooting systems, as well as cooperation and coordination in foreign military assistance, cooperation in the maintenance of military systems, and standardization of the military industry. The UAE and Saudi Arabia share a solid political and economic partnership, with a deep heritage and deep-rooted ties between the people of the two countries. The establishment of the Saudi-Emirati Coordination Council aims to maintain and further enhance these ties. The two countries’ economies are worth one trillion dollars (the largest in the Middle East), and their exports make them one of the top ten exports in the world, with a value of more than $700 billion. The volume of non-oil trade between the two countries is worth $24 billion, while imports totalled nearly $550 billion.